The winner and proud new owner of our annual NWTC Bartender of the Year 2018 goes deservingly to York’s own, Dom Horsley. If you missed it, find out more about this year’s Bar Challenge event in Part One. But, here, we ask the questions and dive under the skin to discover “where did it all begin”? How did it all become to be? Stop worrying… we’ve done a little digging and spoken to the very talented winner himself to see just what it takes to be crowned the crème de le crème in our remarkably skilled world of bar flare. The lovely Dom started with The New World Trading Company two years ago in 2016, joining The Botanist York as a barback. Seven months later he trained to become a fully-fledged NWTC bartender and has since completed training to run our GIN MASTERCLASSES, as well as obtaining his ‘Barblade’ in June this year, the first bartender to do so in York! Yes, Dom. Going a little deeper, Dom mentioned that “originally [he] wasn’t going to enter the competition” - What?!?! But luckily, his Bar Manager influenced most of York’s bartenders to enter. Thank goodness! He further mentioned how this was only his second competition and he was amazed to have won his heat, let alone the final. Accompanied by a small and mighty army of his Yorkshire team, Dom had a fierce support network cheering him on throughout the final and there to celebrate with him in victory. What he describes as a humbling experience, he was genuinely shocked to have been crowned the overall winner. (You can see that moment for yourself, here). The favourite round of Mr Horsley’s and potentially of all the spectators was THE MIXO. The winner of which was the incredibly talented Chris Lewtas, with his expertly created and meticulously choreographed cocktail; “The Return of Aguardiente”. With Bacardi offering the base spirit of this round, Bacardi Quatro had to be at the heart of each drink. Not only did Chris incorporate Bacardi Quatro into each component of his cocktail, he did so with an extraordinary display of skill, creativity, magic and flare. The spectacular concept was inspired by the early life of Don Facundo Bacardi Masso as he spent his teen years producing a rum call Aguardiente. Translating to Fire Water, the rum was named from its huge ABV of 80-90%. This translation, in turn, activated the inspiration for the perfect serve to be an alight goblet, partnered with dry ice to release the essence of the by-products of the concoction. Due to the high percentage of Aguardiente, Chris found it only fitting to produce a Zombie Cocktail, but in true exploration style decided to “mix it up” (pardon the pun) and stir the beverage instead of the usual method of shaking. Just to really knock it out of the park, Chris included the spell-bounding use of magic, MAGIC! into his performance. Further solidifying the precision, care and artistry of “The Return of Aguardiente”. Chris said that with this drink he “really wanted to show the whole of New World that you can achieve great things by being creative! And to me being a bartender within New World Trading company is one of the most fun and creative job roles you could ever have.” Chris mirrored the sessions he had with a trained magician in order to perfect the logistics of the magical amusement that accompanied the production of the cocktail. But, will Dom be entering next year?! The answer is; Yes! With a newfound title to protect, he’s certain he will be! 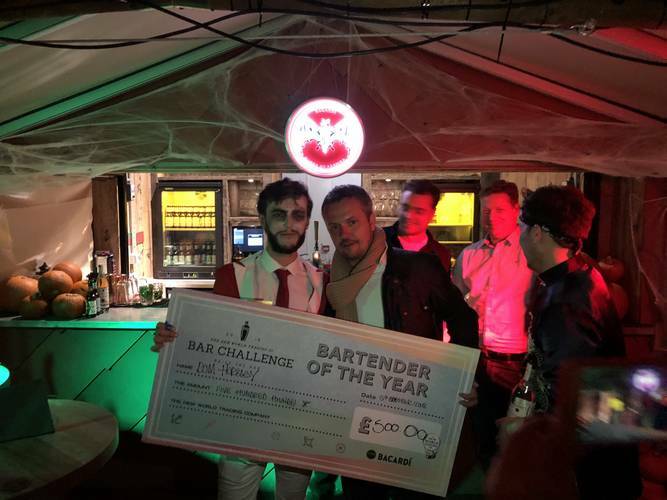 The competition overall made him feel “more confident as a bartender and [he] loved the camaraderie of the event”.